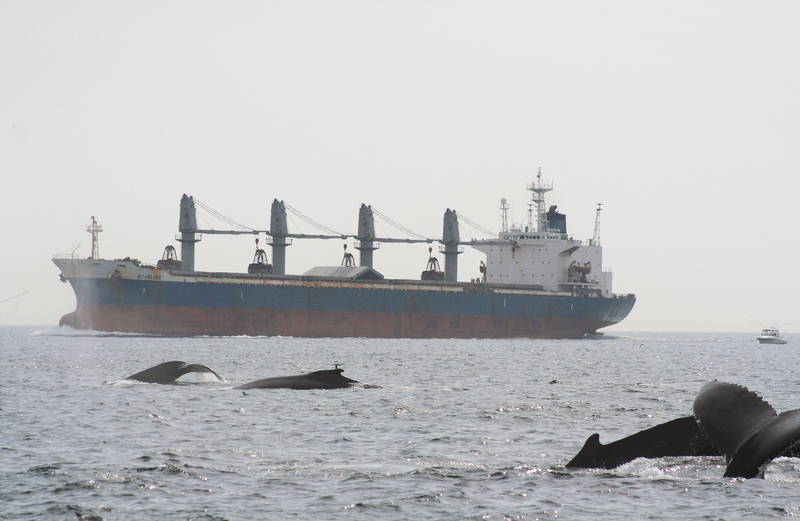 Humpback whales and tanker in Stellwagen Bank National Marine Sanctuary in Massachusetts Bay. In 1972, he was an engineering student in college. Through one of his professors, he met Roger Payne. Roger and his wife, Katy, were the first biologists to discover that whales sing. The Paynes said they needed someone with engineering skills to record whales from a beach in Patagonia, Argentina, and Clark said, "Sure! Why not? Sounds like fun." More than fun, it turned out. "We were living in tents, getting blown around on a beach," Clark recalls. "I had Magellanic penguins in my tent stealing things." He was astonished that people actually got paid to do this sort of thing. The team would go to the beach every day and drop a hydrophone — an underwater microphone — into the ocean. They could hear the whales calling, and they could see big groups of them on the surface. But they had a frustrating problem. "You don't know who's making the sound," Clark explains. "It's like dropping a microphone into Central Park, right? So the question was, 'Hey, Chris, can you figure out a way that you can tell which whale is making the sound?' "
Christopher Clark, a Cornell University senior scientist, shown here in the Central African Republic helping with the Cornell Lab's Elephant Listening Project in 2002, also has spent many years recording whale sounds. Clark had an idea. What if he put three hydrophones in the water, spacing them maybe half a mile apart? The order in which the hydrophones picked up the sound would indicate the whale's location. It's the same way your two ears work — the lag time it takes for a sound to reach one ear compared to the next gives you a sense of where the sound comes from. That changed everything for the biologists. "Suddenly it was like, 'Oh, now I can start putting the picture together of who's saying what when — and what's going on,' " Clark says. "So you're eavesdropping — what's going on in this society here?" 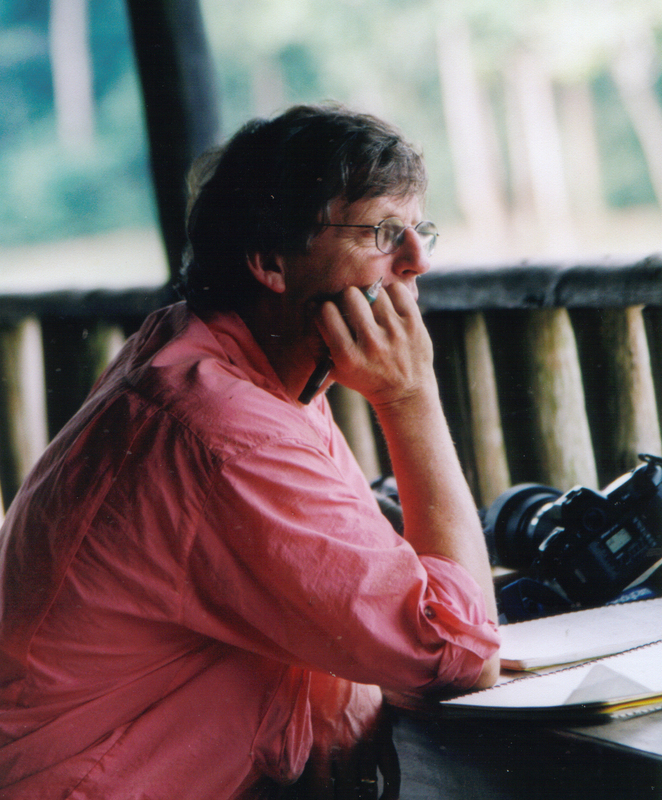 Clark stuck with his whale studies and became a pioneer in the emerging field of bioacoustics — a study of the sound of animals. He'd been a good listener since he was a choirboy singing at the cathedral of St. John the Divine in New York City. But now, instead of concentrating on human voices, he wanted to hear what whales could do. There were lots of whales in the Arctic, so Clark went to Point Barrow, the northern tip of Alaska. The work was challenging, but amazing, he says. "It's minus 30 [degrees] out," he remembers. "You're bundled up. You have complete sensory deprivation — your nose is frozen, your eyes are covered. It's all gray-white, bleached out. ... And you lower the hydrophone into the ocean." And you hear this: "It's a complete cacophony of voices and singers. It's like, oh, my God, it's like I just went into the twilight zone, into a completely different world — belugas, bowheads and bearded seals and ice. And you're going, oh, my God, it's a jungle underneath the ice!" But Clark soon realized that he wasn't the first person to hear all this. When he gave his earphones to a local Inupiat man to listen, the man already knew those sounds. "In their culture, they put the end of an oar up to their jaw and put the paddle into the water, and they listen," Clark says. 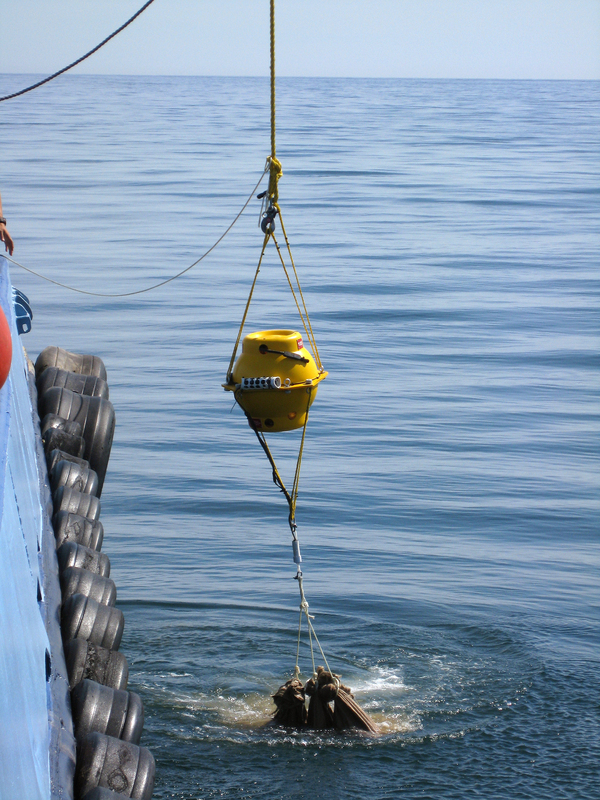 Underwater acoustic recording units being dropped with sandbags into Massachusetts Bay. These recorders are housed in a pressurized glass sphere and have been successfully deployed around the world, from tropical waters to the polar seas. But hydrophones gave much more clarity than oars, and Clark could record the sound. He compiled an archive of whale sounds that biologists were eager to analyze. Then, a chance encounter made him realize that he'd only caught a tiny bit of what was going on in the oceans. On a plane flying back from Alaska, Clark met a Navy captain who knew all about hydrophones. Small world, Clark thought. They had lots to talk about. But they didn't talk again for years. Not until he got a phone call out of the blue — from the U.S. Navy. Would he like to spend a day at a Naval office in Virginia, listening to their hydrophones, they wondered — not to recordings, they said, but to live audio, straight from the ocean? It was a listening program Clark had heard about, "a sort of a whisper of a whisper," he says. So he jumped at the chance. The Navy had hydrophones all over the planet, he learned. They'd been listening mostly for submarines; other sounds were dismissed as "just biologics." "In my world, their noise was my data," Clark says. The Navy let him record some of the sound they were picking up. Then he built a device to shift the frequency so he could hear the deep sounds of whales better. And he heard them everywhere, even thousands of miles away. "I'm going, 'Oh, I see — this is a telescope. Wow, I can do this over an ocean scale, not a little tiny bay,' " he says. "And my life has never been the same." The small dots are whales and the bigger dots are ships moving in and out of Boston Harbor. The dots are the acoustic footprints of the whales and ships. You can see how much louder the ships are and how much area their acoustic signature covers. One thing Clark realized from all this listening was that whales vocalize as they migrate. That meant that, by listening, biologists could track those migrations and find out where they went — when and how far, something that was almost impossible to do by watching. Clark was learning to think like a whale. "I have dreams about being a blue whale," he says. "I simply want to bathe myself in that experience." And as he did just that, he kept hearing other sounds. He heard noise, loud noise — everywhere in the sea. It was the sound of ships' propellers. He realized just how noisy we humans tend to be, and what that might mean for marine animals. "The noises we generate from our shipping traffic, from modern vessels, is clouding — polluting the ocean," he explains. "It's like going to a restaurant, and you and I can barely have a conversation across the table." Clark found that whales sometimes stop singing when they hear human-made sound, and sometimes avoid the sources of that sound. He published articles and papers arguing that the sound of ships is a hazard to whales. And in 2013, the International Maritime Organization set guidelines to make ships quieter — with new designs for propellers, for example. Over the years, a lot of people have begun to study whale song. But why the animals make those calls remains a mystery. Clark says that's not surprising; whales aren't like us. "[If] I'm a blue whale," he says, "my heart beats once a minute. My 'metronome' is completely different from yours. And yet I, as human observer, am expecting their communication to be somehow synchronized with mine? God forbid, you think we're supposed to understand what they are saying or doing in our mode? No." Whales, Clark says, have their own listening culture. It will take a long time to begin to understand it. This story is part of Morning Edition's weekly series called Close Listening: Decoding Nature Through Sound. The summer series is exploring the culture of listening that's developed among scientists seeking to understand how animals communicate. Alison Richards, NPR's Senior Editor for science, is the series' editor.